Ethical clothing company Po-Zu have been approached by George Lucas (you may have heard of him) to make some Star Wars inspired footwear. Unlike previous licensing deals, where companies pay for the privilege for being able to create branded footwear, this is different. Here we have The Man himself approaching a company, whose values he obviously respects, to make Star Wars clothing. Po-Zu create not just ethical clothing, but vegan as well. Thus, the Star Wars footwear are all made from environmentally-friendly materials, without the use of any animal derivatives. The leather is mushroom leather, the canvas is made from organic cotton, the soles are made from natural rubber and the fur is fake. They also look amazing and feel incredibly comfortable. These Star Wars shoes are not just plain shoes with the Star Wars logo emblazoned on the side. Instead, Po-Zu have designed their shoes to reflect the characters they are based on; from the BB-8 inspired orange and red sneakers, to the mid-calf boots based on Rey. There are even some vegan Wookie boots, which will be perfect for these cold winter nights. 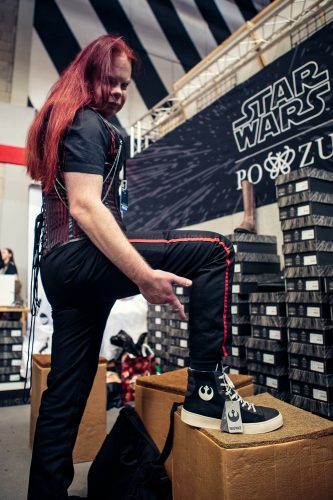 So, if you have a loved one who is into Star Wars and you are still looking for the perfect Christmas gift, then you not could go far wrong with the Star Wars shoes from Po-Zu. All photos by Rachael Griffiths.